The Pulitzer Prize-winning poet Stephen Dunn G’70 is the next speaker in this semester’s Raymond Carver Reading Series at 5:30 p.m. Wednesday, Nov. 13, in Gifford Auditorium. A question-and-answer session will precede the reading from 3:45-4:30 p.m. The event is free and open to the public. Parking is available in SU’s paid lots. 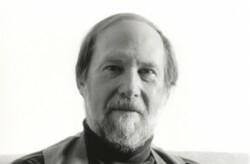 Dunn won the 2001 Pulitzer Prize for Poetry for “Different Hours” (W.W. Norton, 2000). His poetry “is strangely easy to like: philosophical but not arid, lyrical but rarely glib, his storytelling balanced effortlessly between the casual and the vivid,” an August 2001 New York Times review said. “But don’t mistake that ease for lack of staying power.” Although the collection refers to current events—like the millennium and the Oklahoma City bombing—“it also has an out-of-time quality, like a conversation with your smartest friend during a long-distance road trip,” the review continued. Dunn attended Hofstra University on a basketball scholarship and spent a year playing professional ball. He is Distinguished Professor Emeritus of Creative Writing at Richard Stockton College in New Jersey. His work has appeared in publications that include the New Yorker, American Poetry Review, Antaeus, Boulevard, Georgia Review, Paris Review, Poetry and Virginia Quarterly Review. Dunn is the inaugural Dopulos Distinguished Poet in the Raymond Carver Reading Series. The Dopulos Distinguished Poet has been funded by the Dopulos/Larsen family. The Raymond Carver Reading Series is named for the great short story writer and poet who taught at SU in the 1980s and died in 1988, and is presented by the Creative Writing Program in SU’s College of Arts and Sciences. The series will continue with the following authors. All readings begin at 5:30 p.m. in Gifford Auditorium. Question-and-answer sessions are from 3:45-4:30 p.m. Further information is available by calling 315-443-2174. Nov. 20: Cheryl Strayed G’02, is author of the New York Times bestselling memoir “Wild: From Lost to Found on the Pacific Crest Trail” (Knopf, 2012), “Tiny Beautiful Things: Advice on Love and Life From Dear Sugar” (Vintage Books, 2012) and the novel “Torch” (Houghton Mifflin, 2006). Dec. 4: Jane Springer is a poet whose books include “Dear Blackbird” (University of Utah Press, 2007) and “Murder Ballad” (Alice James Books, 2012).